Behaviour and build much as Pied. 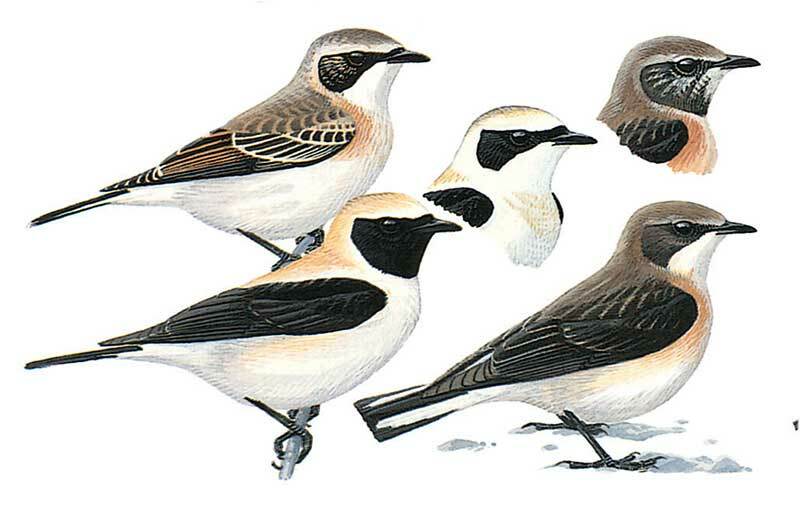 Male of black-throated form can be confused with male Finsch’s; white-throated male only confusable with some ‘vittata’ forms of Pied. Black of throat/ear-coverts not joined with black of wings and shoulder; mantle whitish (summer) or buffish grey (autumn). Tail pattern as Pied. See Pied for separation between 1st autumn females of the two species. In autumn best told from 1st autumn Northern Wheatear by longer tail with terminal tail-band having much black extending up the sides of outer feathers (in Northern Wheatear, terminal band of fairly even width). See also female Finsch’s. Hybridizes with Pied Wheatear in E Turkey.